The 780 Smart 4-20 Module gives your ISCO 6700 Series Sampler the capability to interpret analog data from other equipment that you already own. For example, if you have flow meters that output a 4-20 mA signal, the 780 Module allows you to use that flow signal to pace your 6700 or 6712 sampler. The sampler with 780 module also converts the signal into digital information that can be displayed in real time and stored for future retrieval and analysis using Flowlink® Software. If the signal is not a flow proportional signal, real time information is still displayed, but in a simple, easy-to understand percentage of full scale. This signal can then be used to initiate sampling routines or individual samples. Connection to the analog signal is also a snap. The Model 780 comes with a cable with twin leads attached. Simply connect it to your analog signal and program the sampler for proper operation. Converts flow-proportional signal to selectable flow units, enabling the 6700 Sampler to display real time flow rate and totalized flow. Enables sampler pacing in actual flow units instead of an arbitrary number of flow pulses from a flow meter. 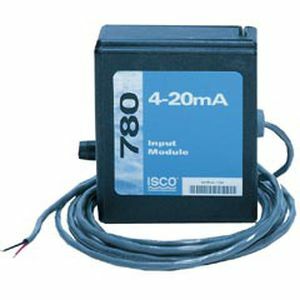 An ISCO 6700 Series Sampler with 780 module can interpret any 4-20 analog signal and use the data to pace sampling and store the data digitally for later retrieval and analysis.